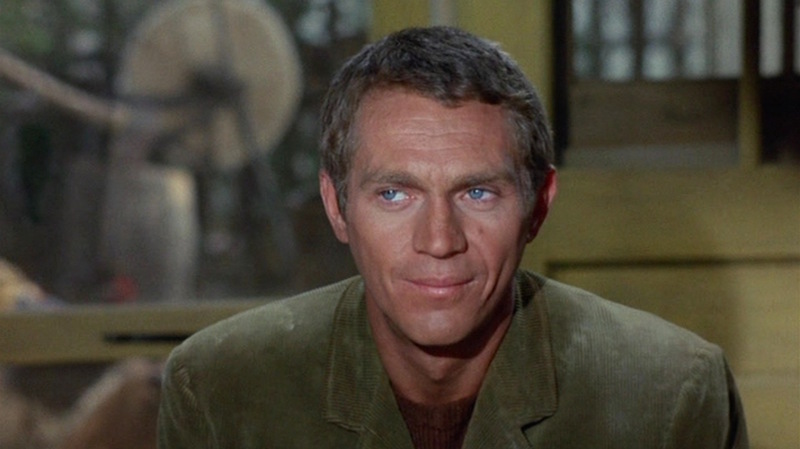 McQueen’s timeless sense of cool adds an era-defying quality to his performance as poker prodigy Eric “the Kid” Stoner. The Kid’s simple, functional wardrobe was hip enough to be contemporary to the 1960s while also reflective of the film’s 1930s setting. 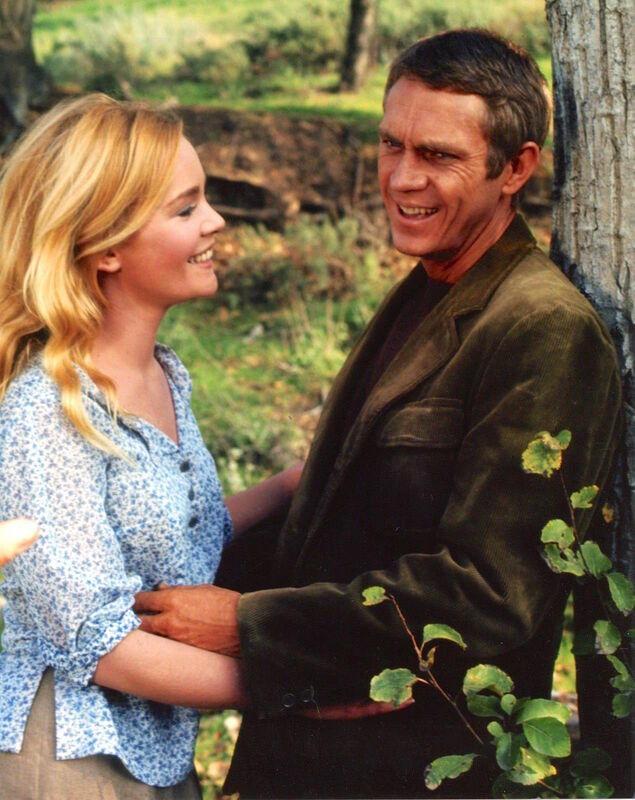 McQueen’s enduring wardrobe remains relevant more than 50 years later, including outfits like this fall-friendly ensemble from the Kid’s visit to the farm where his girlfriend Christian (Tuesday Weld) lives with her family, a retreat from the Big Easy – and away from the seductive Melba (Ann-Margret) – before his high-stakes poker game. 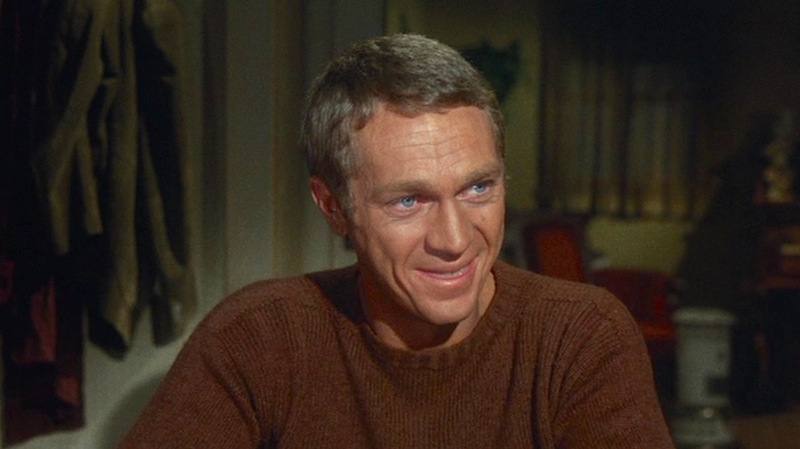 Like the gray tweed jacket and navy sweater worn in a previous scene, The Kid’s sports coat and sweater delivers an early template for the Bullitt look that would be forever associated with Steve McQueen’s image. When he’s in the city, the Kid tends to wear cooler tones like black, gray, and blue, but this trip to Christian’s bucolic homestead calls for earthy tones that reflect the bucolic, homespun environment. Thus, this olive pinwale corduroy (also known as “needlecord”) single-breasted sport jacket makes its sole appearance in this sequence. The Kid turns on the charm. Likely ventless like his gray tweed jacket, this sports coat has fully padded shoulders with no roping at the sleeveheads. There are two buttons on each cuff. The corduroy sport jacket has notch lapels that roll to a high-fastening three-button front. The Kid wears the collar turned up when he first arrives at Christian’s door, revealing the reinforcing square patch under each collar leaf. The jacket has four external patch pockets, two on the chest and two larger ones on the hips, all covered with non-fastening flaps. Turning up the collar transforms the Kid’s decent sports coat into a warm casual jacket. The Kid wears the rust burnt orange ribbed knit wool sweater that he wore with his black waxed jacket. The Kid wears the same brown wool trousers with single forward pleats, a hook-and-eye extended tab waistband front closure, small belt loops (sans belt), slanted side pockets, and turn-ups (cuffs) that he wore with the brown shawl-collar cardigan. This pleasant pastoral scene could not be further from the world the Kid is used to… yet he seems to be taking to it rather well. Not surprising for a down-on-his-luck young man who spends his money on poker games rather than trips to the tailor, the Kid only has one set of shoes, a pair of black patent leather derbies that take some abuse over the course of the movie as his craft leads to a few back-window escapes in the murky alleyways of Depression-era New Orleans. 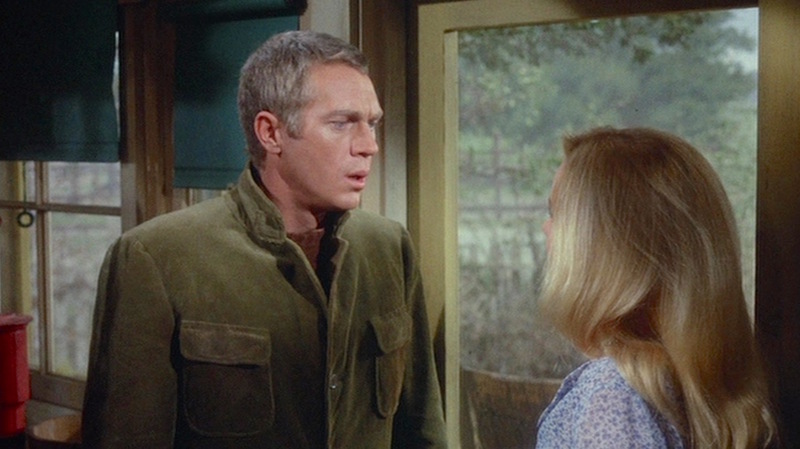 In The Cincinnati Kid, Steve McQueen continues establishing the future Bullitt template with a textured sports coat over a pullover sweater with dark trousers, wearing earthy tones here appropriate for his getaway from the big city into the more pastoral settings of Christian’s family farm.